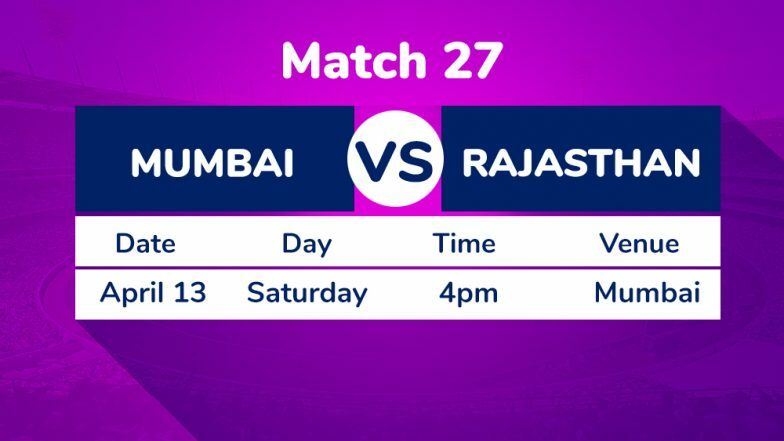 Mumbai, April 12: A confident Mumbai Indians will look to consolidate their position in the Indian Premier League (IPL) points table when they host a lacklustre Rajasthan Royals at the Wankhede Stadium here on Saturday. Mumbai has won their last three games and are placed third on the table with four wins from six games while their opponents have managed to win just one game so far and lie at the seventh place. In the absence of regular skipper Rohit Sharma, Kieron Pollard led Mumbai from the front and came up with two match winning performances. He was ably supported by Alzarri Joseph, who has been the find of the tournament. A leg injury had forced Rohit to miss their game against Kings XI Punjab (KXIP) and it remains to be seen whether the skipper has fully recovered or not. In the game against Punjab where Mumbai were chasing a mammoth 198 for victory, Pollard smashed a 31-ball 83 to ensure another victory for the three-time champions. Joseph, who had a dream debut after returning with the best IPL figures of 6/12 against Sunrisers Hyderabad, played a crucial cameo down the order against Punjab to help Mumbai cross the line in time. Mumbai Indians vs Rajasthan Royals Live Cricket Score 27th T20 Match. On Saturday, all eyes will once again be on Pollard and Joseph, who are currently in top form. If Rohit comes back in the playing eleven, it will further strengthen Mumbai's batting line-up, which features some dependable names like Hardik Pandya, Krunal Pandya, Quinton de Kock and Ishan Kishan. Coming to Rajasthan, it seems nothing is going their way as they lost a nail-biter against defending champions Chennai Super Kings on Thursday, thanks to Mitchell Santner's last ball six which kept the yellow brigade at the top of the table. VIVO IPL 2019 Schedule: Full League Stage Time Table With Fixtures, Match Dates and Venue Details. Rajasthan would once again bank on Jofra Archer, who conceded just 19 runs from his four overs, giving his team a chance to defend a modest 152 against the star studded Chennai team. Shreyas Gopal has also been amongst the wickets after picking up eight from six games. The leg-spinner however, failed to perform against the yellow brigade and would have to step up in another high-profile class. Rajasthan's batting includes skipper Ajinkya Rahane, Sanju Samson, Steve Smith and Jos Buttler and with the league reaching the halfway mark, this would be the right time for them to deliver. Rajasthan pacers Jaydev Unadkat and Dhawal Kulkarni along with Shreyas also need to come out with something special if they want to stay alive in the tournament. Overall, looking at the recent past, Mumbai will be the favourites on Saturday. However, with some stars in their ranks, Rajasthan could also cause an upset.